Blood. Oil. Money. Could there really be a more dangerous combination of elements? 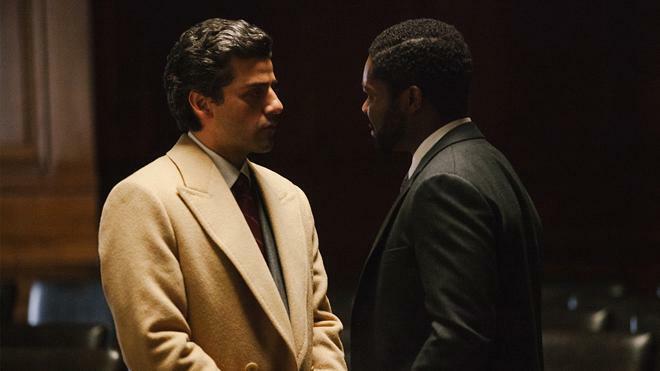 When they collide, tragedy is almost always left in their wake -- and in J. C. Chandor's 'A Most Violent Year,' all three are churned together into a slow-burn drama steeped in ambition and escalating tension. A slightly atypical gangster film, the movie offers an understated but powerful examination of violence within the American Dream. Though the runtime is a little too measured for its own good, the movie's refusal to sensationalize its brutality leads to a thoughtful and ultimately absorbing experience… even if its deliberate rhythm can be a tad anticlimactic. 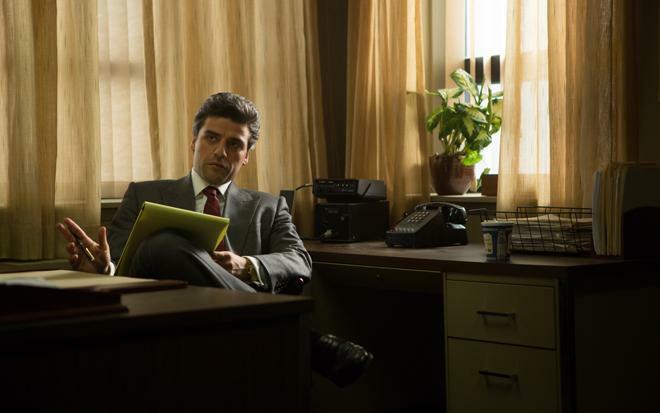 Set in New York City during 1981 -- one of its most violent years on record -- the script follows Abel Morales (Oscar Isaac), an immigrant who has worked his way up to become a successful businessman. When his heating oil business is threatened by thieves, Abel attempts to expose his enemies. But a simultaneous investigation by the government into the legality of his work complicates matters. With potential threats coming from all angles, everything Abel has worked for is put into jeopardy, forcing the man to fight for his livelihood… and perhaps his life itself. Slow and calculating, the runtime presents a carefully honed series of gradually escalating situations that are punctuated by periodic boiling points. To this end, most of the film simply focuses on various deal-making conversations between Abel and his colleagues, family, rivals, and investigators, following the man as he attempts to save his business from outside dangers. Complementing this subtle sense of building tension, is an understated but potent visual style marked by very slow push-ins and push-outs -- offering a delicate implication of movement that adds a slightly ominous sense of escalation to the picture. These more subdued scenes are then joined by occasional fits of action -- and though usually brief, these more aggressive set pieces do a solid job of releasing the movie's building tensions. With that said, rather than sensationalize the film's gangster influenced brutality, Chandor deliberately attempts to present the movie's violence in a realistic manner, stripping away flashy excess to focus things on a more "human scale." In fact, despite the film's title, there really isn't a lot of bloodshed or violence here -- making the few moments of brutality present all the more powerful. Likewise, none of the characters are portrayed as sadistic in their actions. Instead, they seem hesitant and conflicted about every punch and gunshot. The goal from all sides isn't really to hurt or kill anyone. They all just want to make money -- even if it requires some morally "loose" methods. As Abel Morales, star Oscar Isaac creates a man desperate to hold onto his success without resorting to criminal activity. With this in mind, the character mostly appears to be an honorable man, but there are key instances that imply certain ethical vulnerabilities. Ultimately, the level to which Abel is willing to bend the rules becomes paramount to the film's deeper themes, creating a story where the protagonist attempts to do the "most right thing" -- a distinction that proves to be rather ambiguous. Multifaceted supporting turns from Jessica Chastain, David Oyelowo, and Elyes Gabel muddy the waters even further, casting a grey shadow over the entire ensemble. Unfortunately, as compelling as most of the filmmaking is, the movie is not without some notable faults, particularly when it comes to pacing. I understand that the slow rhythm here is artistically deliberate, but there are times when it really feels like nothing is happening, making certain beats seem stagnant. Furthermore, the film's ending comes across as a bit anticlimactic, failing to leave the intended impression. Still, the majority of the experience remains engaging, tackling some interesting themes related to professional mobility, crime, and determination. With a heavy emphasis on the "slow" in slow-burn, 'A Most Violent Year' presents a tense and mostly satisfying experience. The movie's atypical examination of violence is powerful in its realism, though there are some problematic stretches here and there. Though heavily inspired by previous gangster films in both form and content, the director presents a slightly different twist on these familiar conventions. The film might be a little too methodical for some, but its contemplative style is deceptively dense and thought-provoking. Lionsgate brings 'A Most Violent Year' to Blu-ray on a single BD-50 disc that comes housed inside a keepcase with a cardboard slipcover. Instructions for a Digital HD UltraViolet copy are included inside. After some skippable trailers, the disc transitions to a traditional menu screen. The packaging indicates the release is Region A coded. The movie is provided with a 1080p/AVC MPEG-4 transfer in the 2.35:1 aspect ratio. Though solid overall, there are some issues related to contrast and compression, particularly in darker scenes. The digital source is mostly clean but retains a relatively gritty atmosphere even without the aid of natural film grain. Clarity and depth are pleasing though the picture veers toward a softer style. The color palette features a predominantly yellow hue, further evoking the period piece nature of the story. Though this style doesn't lend itself to much pop, the aesthetic works well with the tone of the film. Contrast during bright scenes is fine, but dark sequences can be quite problematic. Blacks veer toward a milky grey or blue, and shadow delineation is often flat and crushed with occasional signs of compression. The scene where Abel and Anna hit the deer at night is particularly prone to these issues. Some of the problems present here might be inherent to the original digital photography, but the results still hold back the transfer. Thankfully, the majority of the presentation looks pretty good and the movie's visual style is strong. The film is presented with an English DTS-HD MA 5.1 track along with English SDH and Spanish subtitles. Marked by a potent juxtaposition of quiet stretches and brief loud, aggressive moments, the track offers a strong sense of mood and immersion. Dialogue is clear and clean with no balance issues. The soundscape is delicate and spacious with a fairly subdued but still textured and layered atmosphere. Directionality is strong, spreading effects work between the front and surround speakers with smooth, natural imaging that gently extends sounds all around the room (city ambience, an airplane overheard, etc.). And while most of the runtime is fairly quiet in temperament, a few key scenes provide a rather jarring jolt with wide dynamic range and some genuine kick. The film's somber and slowly escalating score also comes through well and features strong separation. Effectively subtle and aggressive during key sequences, the mix here suits the material very well, helping to draw out the movie's palpable tension. Lionsgate has put together a nice collection of supplements, including a commentary and some behind-the-scenes featurettes. All of the extras are presented in 1080p with Dolby Digital 2.0 sound. Audio Commentary with J. C. Chandor, Neal Dodson, and Anna Gerb – The film's writer/director and producers provide a steady and informative commentary. The trio discuss locations, the VFX used to achieve period accuracy, and the movie's realistic depiction of violence. Though the director can over-explain certain beats in the movie, this is a very worthwhile track. Behind the Violence (HD, 44 min) – Playable separately in two parts or together as one, this comprehensive doc focuses on the film's production. The cast and crew address the movie's dangerous NYC 1981 setting, themes, script, inspirations, casting, costumes and visuals. A Conversation with Jessica Chastain and Oscar Isaac (HD) – This supplement is separated into three parts: The Early Years (4 min), A Shared Foundation (4 min), and Mastering the Craft (5 min). The two actors sit down together to discuss their impetus toward acting, going to Julliard together, approach to their craft, and what it's like to work together. We Can Cure Violence (HD, 2 min) – This is basically a PSA about preventing violence, and while that's certainly a good cause, I'm not sure why it is included here. The Contagious Nature of Violence: The Origins of A Most Violent Year (HD, 3 min) – This featurette addresses the film's examination of violence, its contagious nature, and the work of the Cure Violence organization. Again, though the message is admirable, this feels like a forced and tacked on inclusion. Deleted Scenes (HD, 8 min) – Five deleted scenes are viewable separately or together. We get more material with Abel's family and his legal maneuvering. This is all good stuff but not essential. Theatrical Trailer (HD, 2 min) – The film's trailer is included with Dolby Digital 5.1 sound. Teaser Trailer (HD, 1 min) – The film's teaser is included with Dolby Digital 5.1 sound. Inner City Crew (HD, 1 min) – This short clip features Oscar Isaac jogging with some members of the crew. 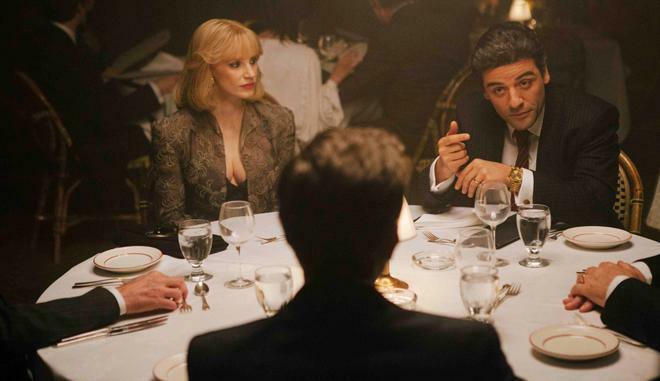 J. C. Chandor's 'A Most Violent Year' is an engaging gangster drama that offers an atypical examination of violence and ambition. There are some pacing concerns, but the film remains mostly engaging. Despite some issues with black levels, the video transfer is solid and the audio mix is strong. Supplements include a worthwhile commentary and a few interesting featurettes. Though the film fails to become a new classic in the genre, the movie is ultimately thought-provoking and complex. Worth a look.